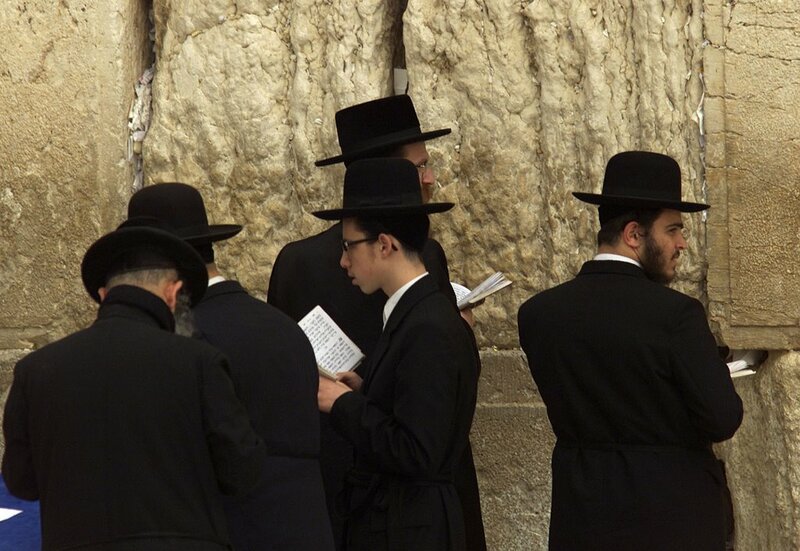 In Jerusalem, a female CNN journalist heard about a very old Jewish man who had been going to the Wailing Wall to pray, twice a day, everyday, for a long, long time. So she went to check it out. She went to the Wailing Wall and there he was! She watched him pray and after about 45 minutes, when he turned to leave, she approached him for an interview. I’m sorry but I do not find it wonderful. It makes me very uncomfortable. For me at least, this is not funny. It is cruel in the extreme and it is unecessary. We can be critical, we can disagree vehemently, we can feel angry about or we can feel saddened by what we believe is an illogical approach to the mysteries of life that religous people may take but, we do not have to insult anyone in order to voice that disagreement, no matter how strongly we hold to it. I remember many years ago I began to study Christianity. I spent many long hours reading various books and texts in order to try and better understand the reasons behind the strength of feeling that existed amongst the followers of this religion. I cannot deny that there are some extremely powerful words written down about and in support of Chritianity, not least those acredited to Jesus himself. There have been many generations of people both inside and outside of that religion who have studied and tried to understand what this teaching is all about. In the same way all other religions have undergone such a scrutiny. One may think they are wrong but that really isn’t the point. Are we not guilty at times of superficiality? Of basing our opinions upon a few extremes of opinion, of behaviour, or upon a rather lacklustre understanding on our own part, in order to justify and hold up our own opinions, in order to lend more weight to our own view? I cannot help feeling that this seems to be what amounts to another form of demonization, no less pernicious or wrong than that perpetrated by the National Socialists in Germany in the 1930’s against the Jewish people. There is no way that one can deny another’s personal experience from which their opinions and beliefs may have arisen. You may disagree but you can never deny their right to hold to those beliefs. No one has that right. And this does not deny any possibility; It does not deny the possibility that they may have been brainwashed, that they may be deluded, that they may even be in our eyes mentally unstable. It does not deny any of these possibilities. For this is not a case of denying or affirming anything it is simply a case of respect; Respect for the fact that each of us may and most often will hold whatever opinion we wish. Any other approach to dealing with the relationship between ideas can do nothing but sow the seeds of conflict between the hosts of those ideas, namely human beings. The proof of this is, I would say, that this type of disrespect of the ideas of others is at the very root of just about every war that has ever been waged on this planet. I strongly disagree (but I would, I posted it). Secondly, out of context, they are actually wailing at a damn wall, finding symbolic significance in brick. The utter pointlessness of trying to fix the problems between people who have the capacity to LIE to themselves like this on a daily basis becomes evident in this joke. But that’s just my opinion. Thirdly: (and most importantly) it’s a joke. Not being able to find humor in these examples through satire and humor is what causes people to start killing each other, e.g. the cartoons of Muhammad that actually got people killed. When you start discussing what is insulting to one and not to another, the debate becomes an unsolvable loop. Most jokes could be considered disrespectful to one person or the other, but that shouldn’t be the reason not to point out obvious problems, especially with the ‘spoonful of sugar approach. I liked this joke because it worked both in and out of context, appealing to both the tireless activists trying to bring understanding between the faiths and atheists alike. As a good friend once said to me, if you can’t laugh at everything, what’s the $&*king point. I absolutely and unequivocally agree with you but, that does not in one iota change that fact that they have the right to hold those beliefs and, therein lies the problem of thought: it is fundamentally contraditory in nature both between us and inside of us. Never once did I say that they should not be allowed to hold that opinion, but neither does it mean that I shouldn’t be able to make fun of that absurdity… re-read my bit on the value of jokes. ‘It is cruel in the extreme and it is unnecessary’. On cruelty in the extreme, I think considering the damage done by religion every day, to men, women and children, in the form of mental and physical abuse, not to mention the killing and atrocities committed in the name of these beliefs, that a joke should not be considered ‘cruel in the extreme’. Why should we tip-toe around these people that clearly do not stop at simply ‘holding’ an opinion, but actively attempt to exert this opinion, often militantly, over other people, regardless of ‘rights’. If the religious of this country got to choose, there would be no birth control, no abortion clinics, no working on Sunday, etc etc ad nauseum. I don’t see them tip-toeing around my rights not to have a religion. If my rebellion against that is to joke, and not induce physical or mental violence, then I think I’m on the right track. And comparing a pointed joke to ‘demonization’, similar to the what the Nazi’s did is utterly absurd. I’m telling a joke. I’m intelligent enough, and respectful enough of human life not to ever allow that to go further. Justifying the murdering of millions of people may well have once begun it’s grisly journey at a harmless joke in a bar somewhere, but only the stupid and psychopathic allowed it to become what it did. Referring to the wailing wall, well I could be referring to the Vatican, or Mecca, or the pyramids. I hope that’s obvious. One last thing. On the subject of absurdity. If a man was talking to a wall, any other wall, they’d lock him away. People in institutes talk to walls for sixty years no problem. But because a bunch of people decided this particular wall is sacred, he’s considered pious and honourable. What’s the difference? I think the answer is obvious. No. It wasn’t the joke that started the war, or the disrespect. It was the people who took it wrong, who had no sense of humor. It was those who took life too seriously that started the wars. A joke is harmless. It’s how you perceive it that matters. I know that’s a gross generalization in terms of the events of world history, but I think the core of it is pretty close to the mark.